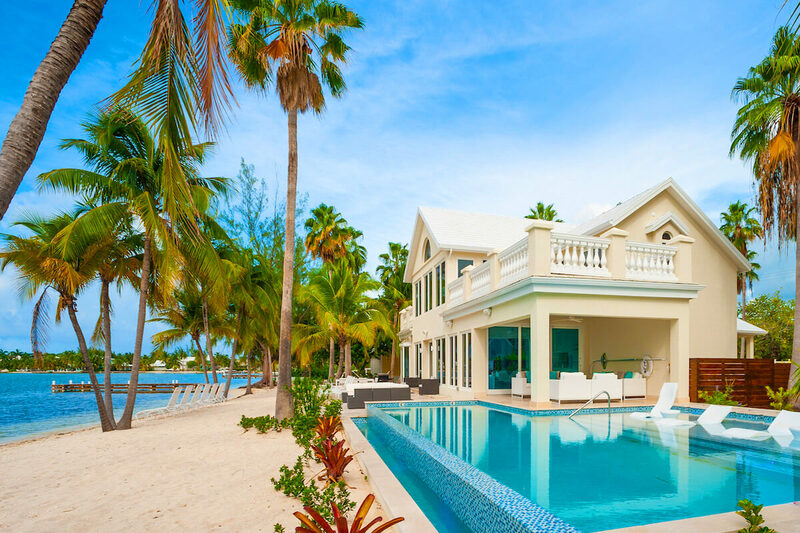 Crystal Waters, formerly known as Mudslide, is the perfect villa for your next family vacation. Every room is oversized, and the common spaces are designed with large parties in mind. The villa is right on the beach, with plenty of windows to take in the view. The Master Suite upstairs is my favorite part of the villa—it’s huge, has three walls of windows, a balcony on either side, and a Jacuzzi in the bathroom. On top of all that, you can walk to two different beach clubs from the villa, with water sports and bars readily available. Crystal Waters is a 5200 sq. ft. home with an open floor plan, chic and vibrant design, modern amenities, and private beach access. With a massive Master Suite and nonstop ocean views, it’s hard to resist the tropical allure of Crystal Waters. The beach is steps away from Crystal Waters’ back door, and loungers sit under palm trees for weary travelers. A long wooden dock leads out into the sea, so guests can get a head start on swimming and snorkeling. The L-shaped infinity pool wraps around the veranda and has in-pool tables for drinks and snacks. There’s also a hammock, paddle boards, outdoor dining, and an outdoor shower. Guests can relax in style in the bright, modern screened porch and the cocktail bar. The entryway doubles as a living room, with a warm atmosphere and tropical decor that welcomes travelers to sit back and relax. An entertainment center with a flatscreen TV and sound system is hidden behind a built-in bookshelf, and both oversized sectionals face one another. There’s actually two living rooms on this level, one at the entryway and one by the back door. The first floor’s sea-facing wall is made up of floor-to-ceiling windows, so guests can have ocean views no matter where they are. Cook up a feast in the spacious kitchen, fully equipped with tons of counter space and cooking appliances. There’s also a lounge area with a bar and wine cooler, and the dining room sits adjacent. Two guest bedrooms are on this level, both with queen-sized beds. One has an ensuite bathroom, and the other sits next to the hall bathroom. On the second floor, the huge Master Suite has three walls of windows that bring in a ton of natural light. There’s a private balcony on both sides with tons of seating, and there’s a Jacuzzi inside the ensuite bathroom. There are also two queen suites that share a bathroom. One suite opens to the balcony, and the other has an attached media room with a pull-out sofa. This villa is equipped with a security system, as well as a full-sized washer and dryer. The villa is a five minute walk from Starfish Point and right across the street from Kaibo Yacht Club, where guests can enjoy water sports, beach bars, coffee shops, ferry service, and restaurants. Rum Point Club is a 10 minute walk away, which has family-friendly dining, a beach bar, and special events. Optional pool heater during winter months for a charge of $250 per week. A refundable damage deposit/excess cleaning fee of $1,500 will be charged at final payment, and refunded within 10 days of departure, barring no damages, excess cleaning or incidentals.